2nd place on the least presentable list. The 4th of July has come and gone. We are half way through the year and it’s fairly hot in the state of Texas. Not 2011 hot mind you, but still very hot. It’s strange days when you consider the upper 90’s not-so-hot. We went to friends for the 4th and had dinner and made our own fireworks show in their front yard. Dinner consisted of hamburgers, potato salad, beer or margaritas, and a bit of pie. Not necessarily in that order. This recipe was pulled from Epicurious circa 1997. You don’t need a national holiday to make or eat this one. But it is certainly worthy of baking for such a day. Grease your pie plate. Whisk 4 1/2 tablespoons ice water and yolk in small bowl to blend. Blend flour, oats, brown sugar, lemon peel and salt in processor. Add butter and process until coarse meal forms. Add yolk mixture and process using on/off turns until moist clumps form. Gather dough together and divide into 2 pieces, 1 slightly larger than the other. Flatten into disks; wrap each in plastic and chill 1 hour or up to 1 day. Preheat oven to 375°F. Roll out larger dough disk on floured surface (I use a floured baking cloth to make it easier to transfer to plate) to 12-inch round. Transfer dough to 9-inch-diameter glass pie dish. Fold overhang under (if you have any). Crimp edges. Line your crust with foil. Fill with dried beans or pie weights. Bake 10 minutes. Remove foil and beans. Continue to bake until crust is set, about 8 minutes. Cool to room temperature. Roll out remaining dough disk on floured surface to 12-inch round. Cut into 1/2-inch-wide strips. Mix 1 cup sugar, cornstarch, orange peel and nutmeg in large bowl. Add all berries and preserves and toss to blend. Pour filling into crust. Place dough strips atop pie, forming lattice; trim excess. Gently press strip ends to crust. Brush lattice with egg glaze. Sprinkle with 1 tablespoon sugar. Place pie on baking sheet. Bake until crust is golden brown and filling bubbles thickly in center, covering edges with foil collar if browning too quickly, about 1 hour. Cool on rack. Serve lukewarm or at room temperature, with or without whipped cream. Welcome through the doorway and into the holiday season. 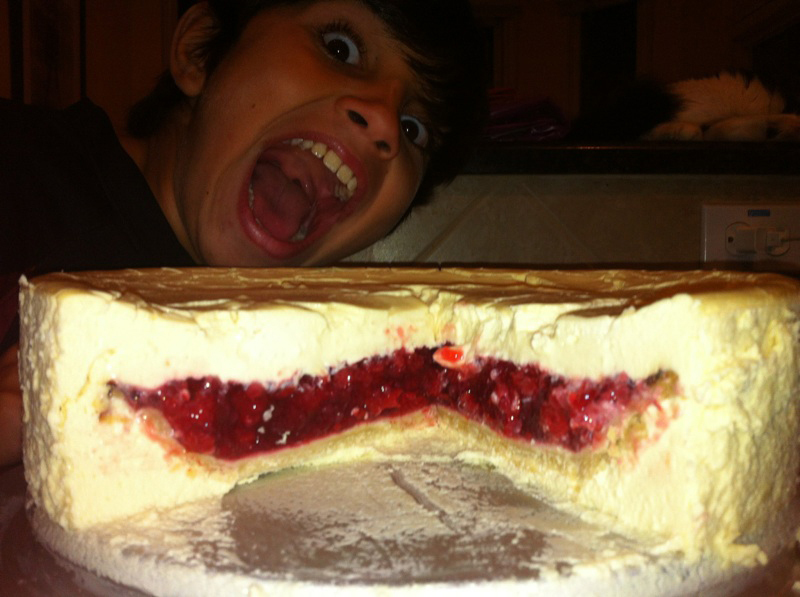 This recipe, a cherry pie baked into the center of a cheesecake, was created for a Halloween bake-off at work. I didn’t win any prizes for this although it was a dessert that disappeared. You will need a 9 inch pie tin and a 10 inch spring form for this concoction. A food processor and a hand-held electric mixer would be helpful too. Move your oven rack to a lower position. Pre-heat your oven to 350F. In a food processor, mix the flour, sugar and salt. Add butter and blend using on/off turns. Process until coarse meal forms. Add water and blend using on/off turns. Add water by teaspoon if dough seems dry. Butter or vegetable oil the inside of a 9 inch pie pan. A smaller pie tin would probably be best as you want to make sure the pie you put in the cake is a bit smaller and more dense. 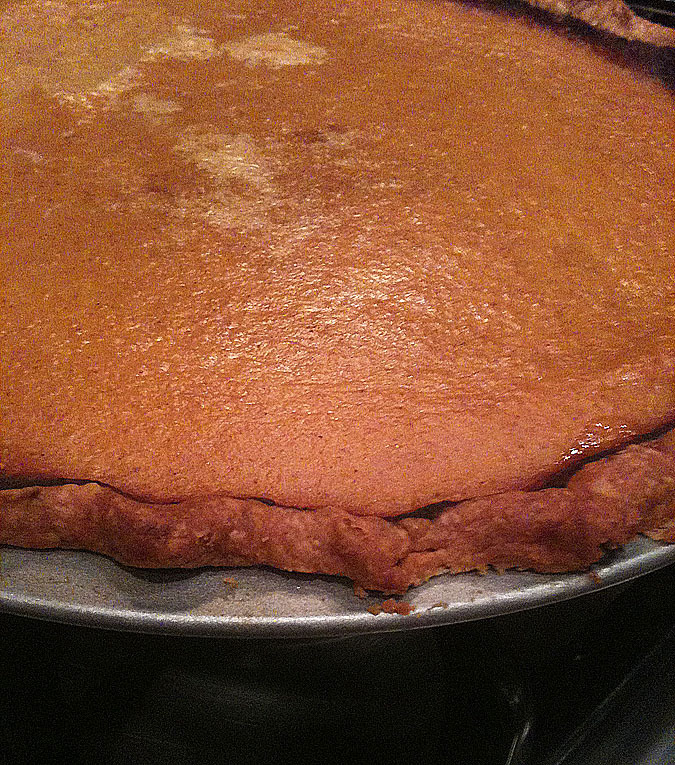 Dense is key as you don’t want the pie to come apart in transfer. On a lightly floured surface, roll out the dough into a 12 inch diameter circle. Transfer to a 9 inch pie dish. Clip the dough to the edge of the pie tin. No need to flute or crimp the edges, it’s going into in a cheesecake. Line the crust with foil and place dried beans or pie weights. Bake 10-15 minutes. Remove the foil and beans. Bake for another 10-15 minutes or until the crust is a light brown. Set aside to cool. Once cooled, create a tin foil collar for your crust, making sure your edges are covered. You don’t want to burn the edge when you bake the pie with the filling. Place the cherries in a large bowl. Add the sugar, tapioca, salt, lemon juice, vanilla extract, and almond extract and mix with a large wooden or plastic spoon until joined. Pour the mixture into the baked pie shell. Spread the cherry filling to the tin foil collar. Bake at 425F, for 30 minutes. Reduce heat to 350F and bake an extra 25-30 minutes. Place on wire rack. Let cool completely. Transfer to fridge and allow 1-2 hours to chill. Two hours would be optimal. Pre-heat oven to 375 degrees. Wrap outside of 10-inch spring form pan with foil. Butter the inside of your spring form. In large bowl, blend cream cheese and butter until smooth. Mix in sugar and cornstarch. Blend in sour cream and whipping cream. Add cherry brandy and vanilla. Stir in eggs and egg yolk one or two at a time, mixing thoroughly between each addition. Pour half the batter into your spring form. 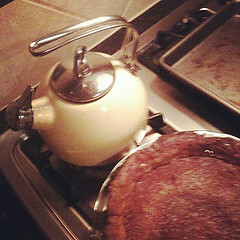 Separate your chilled pie from the pie tin (we lined a plate with plastic wrap and turned the pie upside to separate). Remove the plastic wrap from the top of the pie. 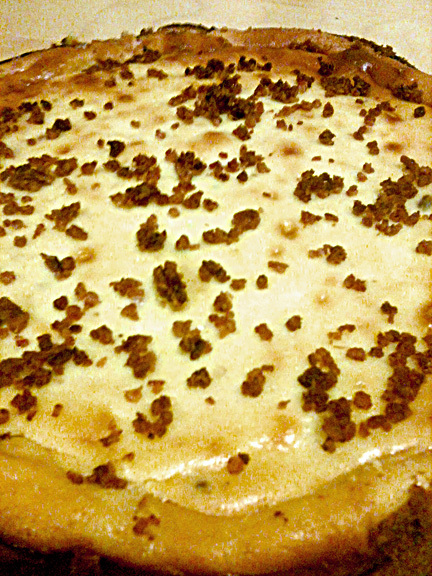 Place the pie into the cheese cake mix. Pour the remaining batter over the top of the pie. Place the spring form in another pan at least 1 inch wider and add at least one inch of water to outside pan (prevents cracks in sides of the cheesecake). Bake on center rack for approx. 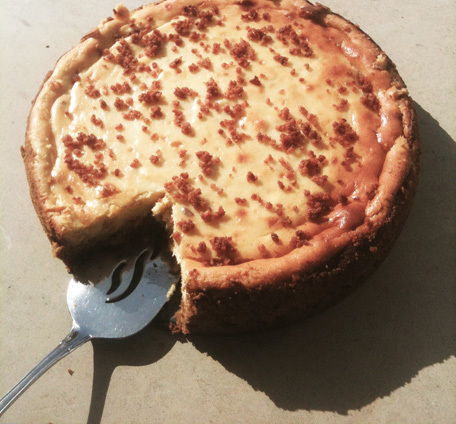 80-90 minutes or until the top of your cheesecake is a golden brown. Turn oven off and let cool with door open for 1 hour. Remove cake from water and chill at least 3 hours before removing cake from spring form pan. We sampled some before I brought it in to work just to be sure it was ok;) My wife liked the tartness of the cherry pie. The kids didn’t. I thought it could be a little more sweet but that’s my taste. The cheesecake itself seemed a bit flat and not as fluffy as your usual cheesecake. Then again, it had a pie in the middle of it. My recommendation would be to add your own flavor to this and build on the beta version of this creation. Shine on, Paul. You will always be in my heart. 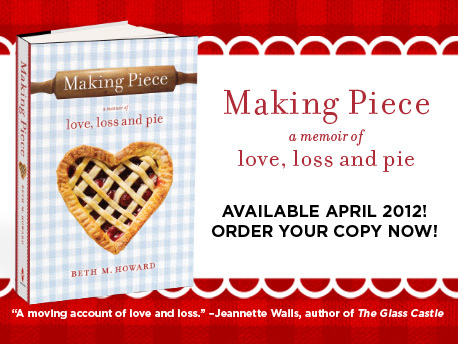 Beth Howard, blogger, TV producer, Tenant of American Gothic House, owner of the Pitchfork Pie Stand, and writer, will be at Austin Bookpeople Tuesday, May 8 to promote her book Making Piece – a memoir of love, loss and pie. There will be a book signing and pie will be served! Beth was kind enough to give a shout out to my blog when I first started baking pies and has been kind in giving guidance in the art of the crust. Of which, I still have my hit-and-miss moments. Blend the flour, sugar and salt together in a food processor. Add butter using on-off turns until mix resembles a coarse meal. Add ice water and combine. Form dough into a ball and flatten into a disk. Wrap in plastic wrap and chill at least 20 minutes. Roll out into 13 inch diameter circle and transfer to a 9 inch pie dish. Trim the excess and crimp as desired. Freeze for 10 minutes. Pre-heat the oven to 450F. Remove crust from freezer and line the bottom with foil. Add beans or pie weights to shell and bake for 15 minutes, until sides are set. Remove from oven and let cool while you prepare your custard filling. Combine melted butter, sugar, salt and cornmeal to make a thick paste. Add the honey, vanilla and vinegar and mix. Fold in the eggs, add the cream and continue to blend. Pour the filling into a pre-baked pie shell and bake at 350 F for 45 to 60 minutes. The filling will puff up like a marshmallow and the center will be just slightly wobbly. Once cooled (at least one hour), finish with a sprinkling of flake sea salt. Slice and serve with freshly whipped cream. My pie looks a bit like it overcooked. I would recommend staying closer to 45 minutes of bake time and not split the 45-60 minutes into a 50 minute bake time, like I did. I like the mix of the sweet and the salt. The salt hits the taste buds first and then the sweet kicks in. I suggest going light on the salt. It’s tasty and the texture doesn’t seem like the custard it’s designed to be. Before I start on my pie blog swan song, I’d like to send healing thoughts and hope for a speedy recovery to my Aunt Judy in Nashville who’s very ill. Please get well soon. 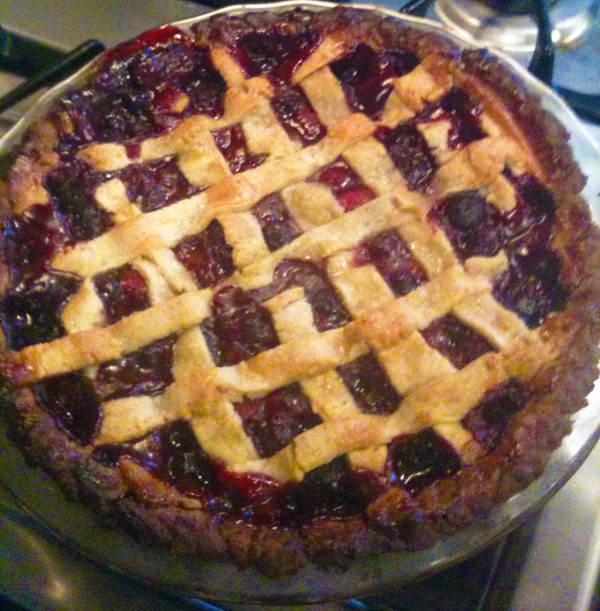 A year ago I decided to do a pie a week and blog about it. It’s been an experience part exciting, boring, humorous, fun, not-so-fun, and an all-around pleasant learning experience (I still need to work on my crust skills though…). For those of you who followed along, thank you. Thank you for asking me how things were going and staying interested. And in doing so, keeping me interested. I hope you’ve used this small library of classic and unique recipes and I also hope you had an even better go of it than I did:) I also hope you continue to use it. For anyone coming along after the fact, thank you for looking around. 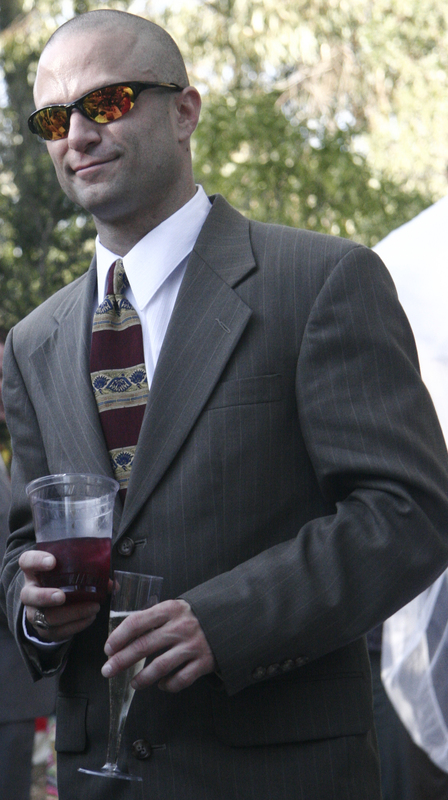 I hope you find something that you would like to try, and something that you enjoy. This has also been a marker of time and happenings in the past year. Nothing too crazy but certainly some sadness and some excellent times, and everything in between. As it should be, it has been a mix. It also marks a transition. It’s re-kindled my desire to get out and do new things. So, I will shortly be fostering of a reasonable number of Siamese cats and volunteering with Austin Siamese Rescue and Austin Pets Alive! Joining me on this adventure is my lovely wife. Yay! Doing good deeds together:) Maybe I can blog about that too. Pie number 52 was something I couldn’t think of a good name for. So I asked my friends on that-social-network-thing for a name and gave them the description; a cherry pie baked inside a chocolate cake and frosted with a semi-sweet chocolate and sour cream frosting. I got some good names and umm, some abstract. I decided to go with The Cherry Bomb. It has a nice ring to it. Thanks Heidi. My final concoction is inspired by Kate Orenberg over at Summer of Pie. You can find her story of the epic Capownie here. I initially wanted to do her recipe, which is 6 pages long. It also requires baking tools I couldn’t McGyver. So I went with a toned down version of her larger concept and created a flavor concoction that my wife came up with. My recipe was 3 pages, which makes sense. Kate created a double-decker. And she did it over the course of a week. I just didn’t have that kind of time. I started putting this together Wednesday at 8am. I finished it around 9:30pm. In between, I also made Baby-Screamin its Head Off in the Middle of the Night and Ruinin my Life Pie, helped Tammi braise a turkey, and did a couple of other things to get my Thanksgiving on. This modipied creation was a bit of work but, after sampling the wares as it was coming together, I think this is going to rock. In a food processor, mix the flour, sugar and salt. Add butter and blend using on/off turns. Process until coarse meal forms. Add water and blend using on/off turns. Add water by teaspoon if dough seems dry. Gather dough into a ball, flatten and chill for at least one hour. Line the inside of a 9 inch pie pan with tin foil. Wrap the edges down and under the side of the tin. A smaller pie tin would probably be best as you want to make sure the pie you put in the cake is a bit smaller and more dense. Dense is key, you don’t want the pie to come apart in transfer. That would be no bueno. On a lightly floured surface, roll out the dough into a 12 inch diameter circle. Transfer to a 9 inch pie dish. Trim the edges to 1/2 inch off side. Fold the extra dough under the edge. Don’t worry about fluting or crimping your edge. Nobody is going to see it unless they excavated their cake. Chill at least an hour. Pre-heat your oven to 350F. Line the crust with foil and place dried beans or pie weights. Bake 20 minutes. Remove the foil and beans. Bake for another 10-15 minutes or until the crust is a light brown. Set aside to cool. Once cooled, create a tin foil collar for your crust, making sure your edges are covered. You don’t want to burn the edge. Place on wire rack. Let cool completely. Transfer to fridge and allow at least an hour to chill. Two hours would be better. It really needs to set. 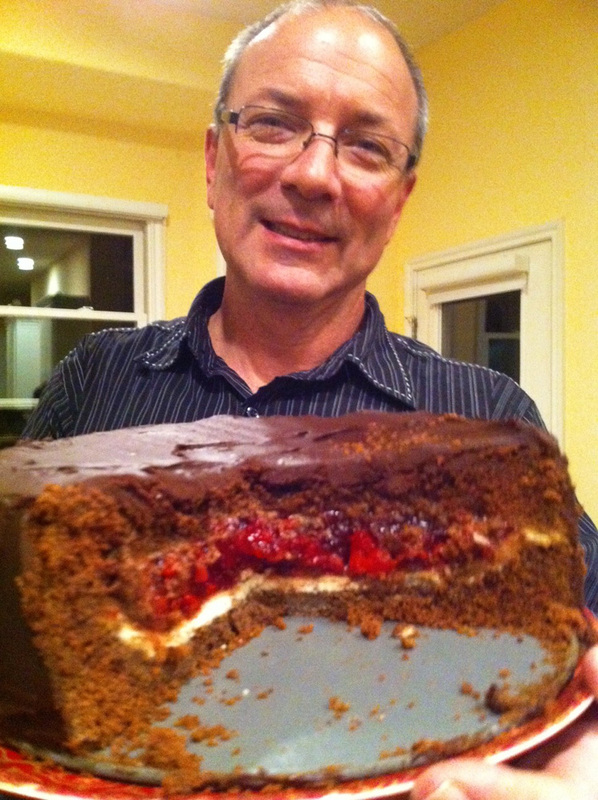 Not a cherry filled brownie. Spray oil and flour 10 inch springform pan, removing excess flour. In a large mixing bowl, combine all ingredients. Blend for 30 seconds on low-speed, stopping to scrape sides and bottom of bowl occasionally. Beat for 3 minutes at medium speed. Pour enough batter to have a ½ inch platform to allow pie to sit on. Bake 5-10 minutes or until batter is just firm enough to hold pie. Unwrap the tin foil collar from the crust. Using the tin foil you lined your pie tin with, loosen and lift the cherry pie from your pie tin. Transfer your cooled cherry pie to the 10 inch springform pan. Pour remaining batter into srpingform. 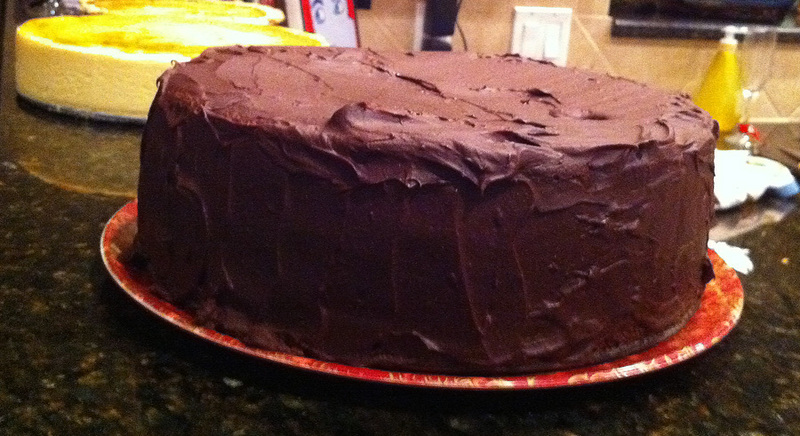 Bake for 40-50 minutes, or until a toothpick inserted in center of cake comes out clean. Let cool for at least 4 hours. 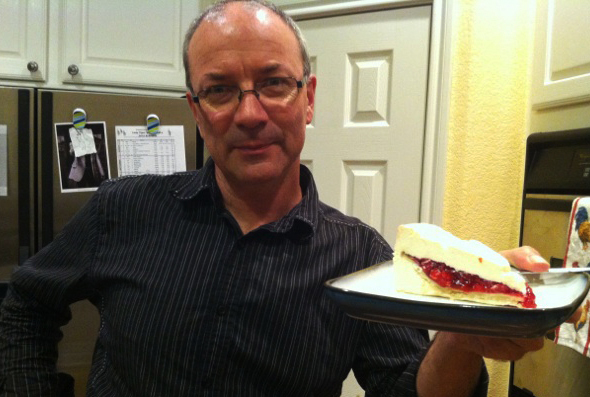 Using a butter knife, run along outer edge of cake to separate from the springform. Remove springform. Place back in fridge until you are ready to frost. In a medium sauce pan, let chips slowly melt over low heat. Remove from heat and let stand for 5 minutes. Stir in sour cream and vanilla. It’s ready to spread. 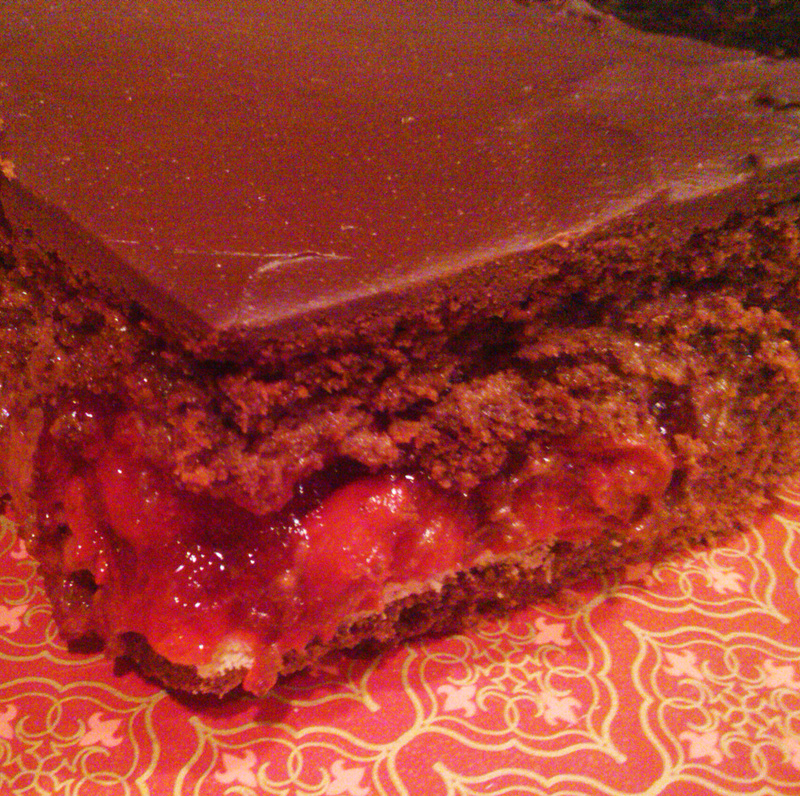 Remove your cherry occupied cake from the fridge and frost away. When done, you should have some extra frosting. Find a good cookie and dip that bad boy into the remaining frosting and enjoy. I’m so glad I did this. I have the disherprin. I may do a few more recipes periodically depending on what I find, or what I feel I can make up. But for now, I have achieved the goal I set for myself and this makes me happy. Have a great holiday season and take care. It’s homemade. So much better. On a lightly floured surface, roll out the dough into a 13 inch diameter circle. Transfer to a 9 inch pie dish. Trim the edges to 1/2 inch off side. Fold the extra dough under the edge and flute or crimp your edge. Chill at least an hour. Pre-heat your oven to 350F. Line the crust with foil and place dried beans or pie weights. Bake 20 minutes. Remove the foil and beans. Bake for another 10-15 minutes or until the crust is a light brown. Set aside to cool. While the crust cools its jets, you can make your pie filling. To make the purée, Cut your pumpkin in half. Clean seeds and string at core. Fill microwave safe dish with 1/2 to 1 cup water and place your halved pumpkins in the dish, with core facing up. Cover in plastic wrap and microwave on “Vegetable” setting. Approximately 7 minutes or until very tender. Remove from microwave and, using a spoon, separate the meat from the rind. Put immediately into a large bowl and using a mixer, blend until smooth. In a small bowl, beat egg whites until foamy. In the mixing bowl with the purée, combine all ingredients except the egg whites. Blend mixture for one minute. Fold in the egg whites and pour into the pie shell. Bake for 10 minutes then reduce heat to 350 degrees. Bake an extra 30 more minutes or until a toothpick inserted in the center comes out clean. This pie is so good. Fresh pumpkin is so much better than canned. It also got a big thumbs up from the kids. A friend was here to sample the pie as well. 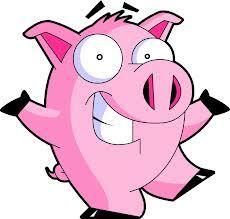 He wants to make it for the Thanksgiving dinner we’ll be hosting here at the house. I’m more than happy to have someone else carry that torch:) I still need to make one more. One more!!! And that one will be a simpler version of something that my friend over at Summer of Pie has done. You’ll have to guess which one.